Kate Middleton, 36, who is pregnant with her third baby, showed her eight month pregnancy bump off in a green coat for a St. Patrick’s Day event today in Hounslow. The Duchess of Cambridge, who was accompanied by husband Prince William, 35, wore a three quarter length green coat buttoned at one side in a traditional green shade to celebrate the Irish holiday. The couple braved the cold weather for the traditional Irish Guards St Patrick’s Day Parade held at the Cavalry Barracks in Hounslow. However, the pregnant Duchess made sure she was suitably wrapped up warm for the important occasion. 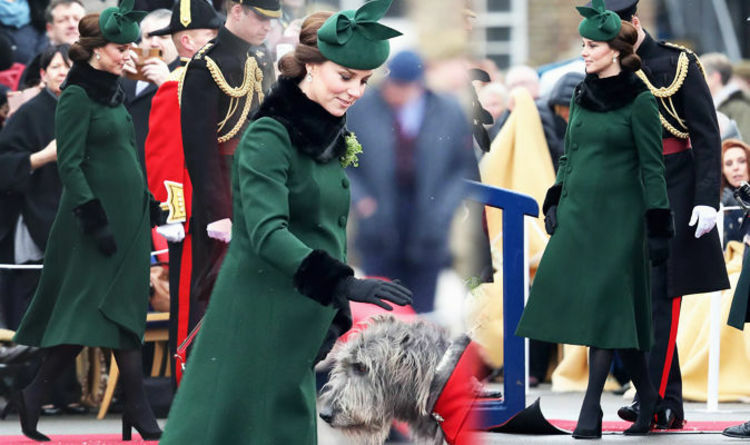 The coat had a furry black trim at the neck and around the cuffs, and Kate paired this with a green hat which had a bow decoration on top of it. She also wore black tights and pointed black court shoes which made her as tall as her husband as she walked out to greet crowds at the event. She wore black matching gloves to cover up her hands in the cold weather, and her hair was worn in a low bun style with volume on top. Prince William, meanwhile, was dressed in an official navy uniform known as the uniform of Colonel of the Irish Guards. It consisted of a long navy jacket emblazoned with badges along the chest and matching trousers which had a red stripe down the side. He also wore a navy hat on his head, and white gloves which were striking against the backdrop of the navy uniform. The couple looked happy and relaxed as they laughed together during the parade, with Kate smiling widely at her husband. Kate Middleton wore a green coat on a great numer of other occasions, including last month while on a public appearance in Sunderland. For the event in Sunderland, she wore a forest green military style coat which covered her baby bump. Her stylish coat was covered in silver buttons which elongated her body and detracted from her bump. She paired the knee length coat with black tights and black suede Tods pumps with high block heel. She also carried a black clutch in one hand, and wore black gloves.